when a patient goes to see a doctor about a problem they’re having. A doctor assesses the patient by interviewing them about their problem. This is a time to gather information about the patient’s history, complaint and any information pertaining to the problem the patient has. As a personal fitness trainer this is a problem that I run into all the time when I watch other fitness trainers practice their profession. 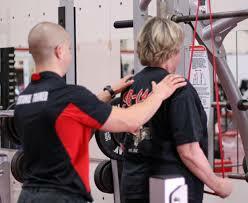 Many personal fitness trainers don’t do assessments before they start to work with their clients. An assessment is one of the most important things a personal trainer can do before starting his client on an exercise program. Besides doing a Para Q questionnaire. Taking measurements, weight and before and after pictures. An assessment is the best tool towards helping a client get back in shape or reach their fitness goal Safely and Effectively. An assessment is the only way a personal trainer can determine how a client’s body is moving and responding to movement.. Many clients that are new to exercise and personal training have many imbalances working against them. Tight muscles, weak and inactive muscles, postural problems and poor movement patterns are a major problem in many adults. This is why all trainers must assess before starting an exercise program with their clients. starting a client on exercise program with light resistance work and modified exercises will not help. The key is to assess the problem areas clients have. All adults in general have tremendous faulty patterns and movement. Starting them up and gradually building them on exercise program when not solve the problem. Here are some tips on what a client should look for in a personal trainer that has experience in the personal training field. Going over past and current injuries. Asking about if certain problem areas have been rehabilitated? Going over MRIs, CAT scans and even x-rays. Even though personal trainers are not knowledgeable in reading these tests. There are verbal written assessment to them. Just an example, if the client had a strained supraspinatus. The personal trainer should have some experience on giving the client a passive motion or very light rehabilitation work to help with that area. As an At home personal fitness trainer who works in the Boca Raton area of Florida. I specialize in assessing the client for any postural distortions or imbalances they might have. By finding out their problems. I design a program along with their fitness goals and to correct their issues. In an hour fitness session. I dedicate 15 minutes to physical rehabilitation work and corrective exercise. All national certification courses have assessments built in their fitness programs. The problem is is that they very general and basic. Boca Raton Five Way Fitness trainers are trained to assess their clients in many different advanced assessment protocols.